When last we heard from Nora Helmer, she had left her husband with the slam of a door. That was (spoiler alert!) 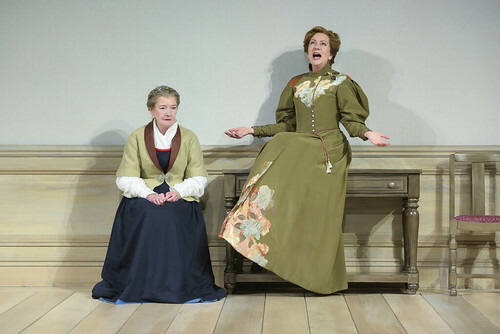 the end of Henrik Ibsen’s 1879 drama A Doll’s House. In the almost 140 years since that door slammed, Nora has been reviled and celebrated for her forward-looking feminist stance on equality and her willingness to leave her three young children behind as she forged a new life away from the traditional bonds of marriage. Now playwright Lucas Hnath imagines what happened to Nora after she stepped through that door in the audaciously titled A Doll’s House, Part 2, which opens the Berkeley Repertory Theatre season in a razor-sharp, vital and funny production directed by Les Waters. For 90 minutes, Nora wrestles with that fateful decision she made a decade and a half before, and the most extraordinary thing abut Hnath’s play is not simply that it’s a crackling good play full of ideas and arguments and regret and ferocity and humor. No, the really extraordinary thing is that it’s actually a worthy sequel to Ibsen. 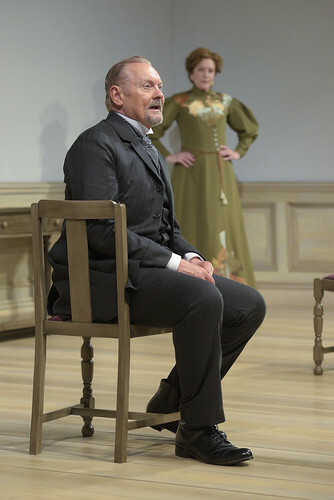 Though his idiom feels much more contemporary than Ibsen (especially in translation), Hnath honors Ibsen and his characters and, most importantly, the challenges that continue to make the original Doll’s House such a powerful drama. Sadly, and perhaps not surprisingly, equality between women and men hasn’t quite come to pass in 140 years. In Hnath’s reacquaintance with Nora, he finds her successful in her own right, living as freely as a woman can in late 19th century Norway, with a career and lovers and a defiant attitude toward marriage, an institution she sees simply as torture. But she finds herself in a predicament that she can only solve with the assistance, much to her dismay, of her ex-husband, Torvald. That’s why she’s back in town. Waters’ production is eloquent and gorgeous in its simplicity. The set by Andrew Boyce turns the Roda stage into a a mostly bare room, blonde wood floors, unadorned walls and only four pieces of furniture – coatrack, table, two chairs. Those chairs are vital to Waters’ staging. As he positions his characters for their battles, the chairs are like game pieces, and with the lighting by Yi Zhao, some of the stage pictures he creates look like they could be right of a Bergman film. Nora’s success is exquisitely conveyed in her dress, designed by Annie Smart, which receives an appreciative gasp from the audience when she whips off her coat to reveal it. As beautiful as the dress is, its power also comes from the way Mary Beth Fisher wears it. Her Nora owns her space. She has fought and won, but being back in Torvald’s house has her a little off-kilter, and we see her argue her way back to confidence and then lose it again in the face of actual human pain she has caused. We also see Nora try to manipulate not only Torvald (John Judd) but also Anne Marie (Nancy E. Carroll), a potential ally in Nora’s plan to wrest what she needs from Torvald. Nora is smart and complicated and full of fury at a system that keeps her, in her words, “beholden to bad rules…so many bad rules in this world.” Fisher’s performance is electric, especially in her scenes with Judd’s Torvald. There’s so much history between them, so much said and unsaid. If Torvald’s journey in the course of a single day seems a bit much, Judd is so believable he can pull it off. Carroll as the beleaguered Anne Marie bears a heavy world weariness that renders almost everything she says equal parts funny and sad. There’s a lot of fury in her, too, and Carroll’s performance is crystalline in every aspect. The play’s final test for Nora is the one she most wanted to avoid: a confrontation with one of her children. As Emmy, Nikki Massoud slowly reveals the inner conflict of an abandoned child finally able to confront the mother who left her with equal parts rage, indifference, revenge and hurt. Waters deftly balances humor and drama, though the play ends up feeling more like a drama, especially where Nora and Torvald are concerned. A Doll’s House, Part 2 is thought provoking and incredibly entertaining. It’s also substantial in that it sits with you afterward. You can leave the doll’s house, but it doesn’t leave you. Lucas Hnath’s A Doll’s House, Part 2 continues through Oct. 21 at Berkeley Repertory Theatre’s Roda Theatre, 2015 Addison St., Berkeley. Tickets are $30-$97. Call 510-647-2949 or visit berkeleyrep.org.